How a Cottage Industry starts. I blame it all on Rita, a fellow PDSA volunteer with whom I exchange emails. Generally speaking, a moderate by nature, or so I like to think, my weakness is what I call "Blue Petering". (To those not living in the UK, "Blue Peter" is a children's television programme famous for its items on how to make useless objects from empty washing up liquid containers and the insides of loo rolls.) The only thing is, once I start, I find it very hard to stop. Rita happened to mention in one email that some time ago she'd enjoyed stencilling plant pots. "That sounds fun", I thought. 6 plantpots, a cat stencil , some black acrylic paint and a rummage around for left over emulsion later, I thought, "I could get into this,." and promptly bought up the local Asda's stock of 4½" pots. One of the advantages of being a PDSA volunteer is that it gives me an outlet for the inevitable surplus I produce when I start "Blue Petering". It would certainly have been useful the summer I embroidered 200 lavender bags. By the time I registered as a volunteer I'd found homes for most of them and had moved onto lavender bags made from pieces of net curtain. (You had to see them.) I knew that particular hobby was getting out of hand when, instead of settling down with a cup of tea at friends' houses I found myself eyeing their net curtains for lavender bag potential. Jen even brought hers round for me when she replaced them. She also sold about 70 of the lavender bags for me. But I digress. Like I said, now I have PDSA fundraising as an outlet, I wasn't unduly daunted by the thought of ending up with large numbers of stencilled pots. I speculated about selling them onto a local Garden Centre. One thing the Catsup project has taught me however, is that good presentation is all important. We may all complain about the extra cost nice packaging adds, but we're still influenced by it. I spent an afternoon phoning around box manufacturers. The cheapest available were £1.23 each. More expensive than the contents. This prompted Jen to suggest that I tried advertising along the lines of, "Buy a box and get a free plant pot!" The following day I was out with a family friend. We stopped for lunch in Seaham and had a wander round the shops there. Outside one were large blocks of thick A3 card. 65 sheets of it in every block for £1.99. My eyes narrowed. "I could make my own boxes", I thought. Letting me loose with 65 sheets of A3 card is akin to giving a chocoholic the free run of a sweet shop. 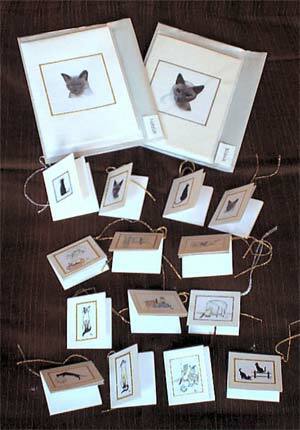 Boxes duly made, there was still plenty of card left. "Greetings cards" sprang to mind. A few experiments later and cards using the same stencils as the plant pots begain to appear. "Not everyone likes black cats", I thought. "I need a bit of variety". 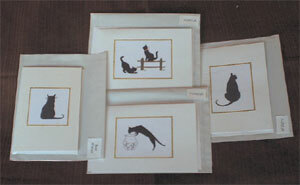 I have absolutely no artistic talent whatsover, so I wasn't chancing my luck with tabbies or tortoiseshells. What I'd manage to produce is anyone's guess, but certainly nothing resembling a cat. My eyes lit on the drawings of Méia that Ro in Brazil kindly lets me use. They work extremely well as you can see from the pictures below. Then, playing around on Photoshop, I found I could change photos of the boys into "paintings". Guillotining card to the right size, left me with lots of thin strips of card. "I'm sure they'll come in handy sooner or later", I thought, squirrelling them away in a corner. Sooner has inevitably proved to be more accurate. Gift tags to match the greetings cards are now being produced at an alarming rate. "How about bookmarks?" suggested Julie. No sooner said than done. I know I'm in the grip of an obsession when I stop making one article at a time and start employing production line methods. My dining room table cannot now be seen under the stack of pots, cards, paper etc. Friends who call round find themselves clearing a space and making a few cards whilst we talk. "Quite compulsive isn't it?" commented both Nora and Ann from Winlaton after their sessions. Rita, you don't know what you started! 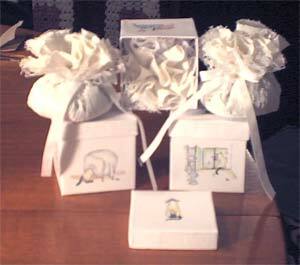 PS Since I started to write this, I've moved onto small gift boxes with lavender bags inside. 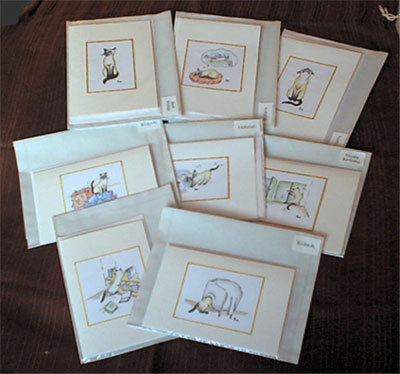 Birthday, Best Wishes, Blank Cards and Notelets using Ro's drawings. Spock and Dracs make sure they're included in everything!